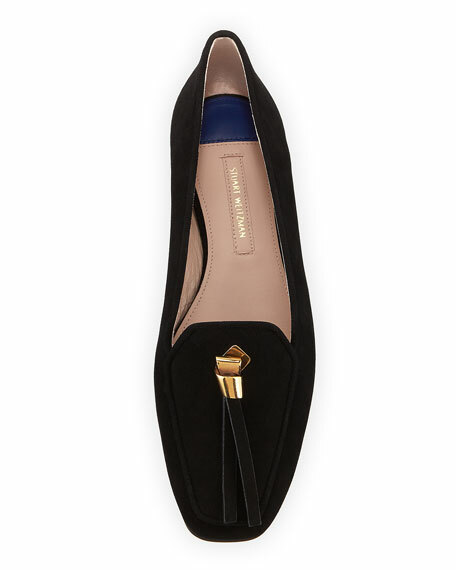 Stuart Weitzman "Slipknot" suede loafers with golden tassel detail. 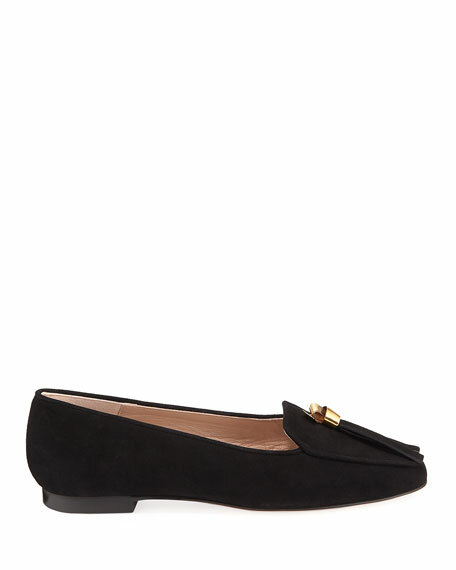 Cole Haan suede loafers with metal bow detail. 0.5" flat heel. Round toe. Notched vamp. Slip-on style. Leather/manmade lining. Lightweight polyurethane midsole and rubber outsole cushioned with GRAND/OS technology for ultimate comfort. "Tali" is imported. Gentle Souls "Luca" sneaker in metallic leather and ruffled elastic. Multilayered comfort system utilizing unique combination of PORON performance cushioning, and additional molded arch support. 0.5" flat heel. Round toe. Slip-on style. Leather lining. Rubber sole. Imported. Mansur Gavriel classic loafer in Italian suede. Available in multiple colors. 0.5" flat stacked heel. Apron toe. Penny keeper strap. Mansur Gavriel classic loafer in Italian suede. Available in multiple colors. 0.5" flat stacked heel. Apron toe. Penny keeper strap. Tonal topstitching. Slip-on style. Made in Italy. Please note: Mansur Gavriel runs small. We suggest ordering one size larger than you would typically wear. No. 21 calfskin and satin loafers with crystal beading. 2.4" chunky heel with platform. Pointed toe. Buckled monk strap at upper. Studded midsole. Rubber outsole. Made in Italy.